Benjamin Rush Milam was born in Frankfort, Kentucky in 1788 to Moses and Elizabeth Boyd Milam. He was named for Dr. Benjamin Rush, who had served soldiers including Moses Milam in the American Revolution at Valley Forge. Ben enlisted in the Kentucky Militia as a private and eventually rose to the rank of Lieutenant during the War of 1812. He remained in the army until his enlistment was concluded in 1815. For a few more years, Milam remained in Kentucky before leaving for the area now known as Texas, then part of Mexico, to seek his fortune. He was engaged in trading with the Comanche Indians near the headwaters of the Colorado River by 1818 when he met David G. Burnet, with whom he would remain friends and business partners over the years. Around that time, he also became acquainted with other individuals including Jose Felix Trespalacios and James Long and learned of their desire to help Mexican revolutionaries secure their independence from Spain. Tensions were high in the area with some supporting the revolution and others supporting Spain. He, Long and Trespalacios went to Veracruz 1819 lobbying for independence but were imprisoned there by the authorities. He remained there for a number of years during which time Long was killed under suspicious circumstances. Milam suspected that it had been under the direction of Trespalacios, and Milam was himself engaged in a plot to kill Trespalacios to avenge the death of Long. When that effort was discovered, Milam was again incarcerated and relocated to prison in Mexico City. He remained in prison until his release was negotiated in about 1824, roughly coinciding with the adoption of Mexico’s first Constitution, establishing the republic form of government. Milam would later reconcile with Trespalacios, be granted Mexican citizenship and accept a commission of colonel in the Mexican Army. For the next few years, he engaged in mining ventures in Mexico with Burnet and others, including Arthur Wavell. Around 1826, he also became an empresario, and tried to assist Wavell in establishing a colony of as many as 300 Anglo settlers between the Guadalupe and Colorado rivers and another along the Red River. Before their epresario contracts expired, Mexico passed a law in 1830 prohibiting further immigration of U. S. citizens into Texas Though their colonization efforts were ultimately unsuccessful, they went to Mexico and tried to secure legal title to the land for the colonists who had settled there. In the midst of this effort, Milam would learn in 1835 of the rise of President-General Antonio Lopes de Santa Anna, who overthrew the Mexican republican government and established his own dictatorship. Milam and others would be briefly imprisoned before Milam was allowed to escape by a friendly Mexican jailer and return to Texas. He became acquainted with Texas soldiers led by George Collinsworth and would join them in the fight for Texas independence from Mexico. The next few months of 1835 would progress rapidly for Milam and the others, leading to their capture of Goliad, and setting the stage for the Siege of Bexar (San Antonio de Bexar). After the success at Goliad, they marched on to San Antonio. 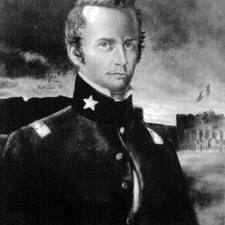 On December 3, 1835, Stephen F. Austin would be replaced by Ed Burleson as commander of the Army. When Milam reached the area around San Antonio, he learned that many of the army had withdrawn to winter quarters for the winter. Milam was convinced that failing to take San Antonio would be a setback to the Texas goal and tried to muster support for the effort. It was here that he was said to have uttered his plea to the troops, “Who will go with old Ben Milam into San Antonio?” The siege began on December 5 and last till December 9, 1935. The Mexican Army under General Martin Perfecto de Cos would surrender and San Antonio would remain in Texas hands for the next few months until the fateful fall of the Alamo. In the Bexar siege, Mexican forces would lose 400 men to death, desertion or wounds against the Texas losses estimated to be 20-30 men. Though the siege of Bexar would be successful, Milam would not live to see the conclusion of the battle or the success of the Revolution. During the siege, he fell in 1835 to a sniper’s gunshot with a fatal wound to the head while trying to scout a Mexican position in the tower of the San Fernando church. The general area where the sniper attack was to have occurred is the so-called Veramendi Palace, no longer in existence, but formerly located at about 151 Soledad Street in San Antonio. Milam was buried in San Antonio. In 1897, the Daughters of the Republic of Texas placed a marker on what was thought to be his original grave site. This marker was moved some 80 years later. Accordingly. over the years, his actual burial place would be lost but it is believed to have been correctly identified by archaeologists in 1993. A large statue of Milam was erected in 1938 at the Milam County Courthouse in Cameron, Texas. Milam County, numerous schools and streets bear his name all across the state. During the siege of Bexar where Milam would lose his life, fighting near his location and wounded about the time Milam was killed was Erastus “Deaf” Smith, to whom is attributed the poem below. Smith sent it to a nephew of Milam where it remained in the family until being published in the Southwestern Historical Quarterly almost a century later. With prouder scorn for coward acts, that make a man a slave. To free and to exalt her, he sought no other creed. To spend the treasure of his blood for liberty and laws.